Below is a comprehensive view of the latest government policies related to the residential property market. 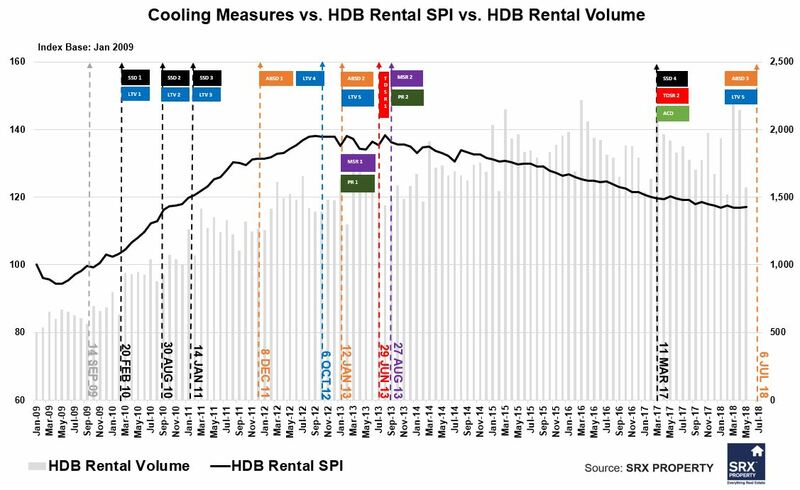 These policies are often referred to as the 'Property Market Cooling Measures'. 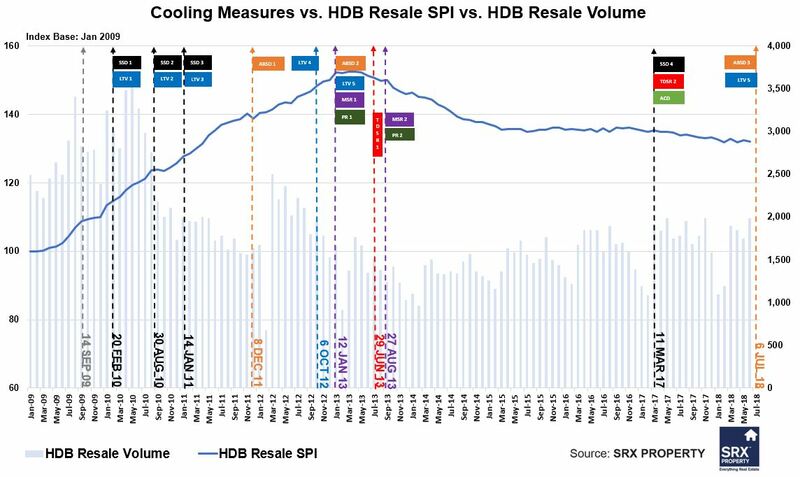 ABSD was first introduced on 7 December 2011 to cool the residential market and revised upwards on 12 Jan 2013 due to further acceleration in the escalation of residential property prices. The latest round of ABSD rate revision was introduced on 6 July 2018. Note: 1Citizens of the USA, Switzerland, Liechtenstein, Norway, Iceland will be treated the same as Singapore Citizens due to FTA agreement. 2. LTV limits tightened by 5% for all housing loans granted by financial institutions. 11 March 2017 1. Seller Stamp Duty (SSD) reduced by 4% for each tier. With this change, SSD will only apply to properties sold within 3 years of purchase, down from 4 years previously. 2. TDSR will not apply to mortgage equity withdrawal loans with Loan-to-Value (LTV) ratio equal or below 50%. 3. Introduced Additional Conveyance Duties (ACD) for Property Holding Equity (PHE). ACD plugs a loophole which exempted companies from paying ABSD and BSD in the past. A PHE is a company whose primary (i.e., > 50%) tangible assets are Singapore residential properties. 9 December, 2013 1. Reduction of Cancellation Fees From 20% to 5% for Executive Condominiums. - Formerly second timers are not required to pay a levy. This is applicable to only new EC land sales which are launched on or after 9th December 2013. - From a previous mortgage servicing ratio (MSR) level of 60% to now 30% of a borrower's gross monthly income. The MSR cap will apply to EC purchases from 10th December 2013 onwards. 27 August, 2013 1. Singapore Permanent Resident Households need to wait three years from the date of obtaining SPR status, before they can buy a resale HDB flat. 2. Maximum tenure for HDB housing loans is reduced from 30 years to 25 years. The Mortgage Servicing Ratio (MSR) limit is reduced from 35% to 30% of the borrower's gross monthly income. 3. Maximum tenure of new housing loans and re-financing facilities granted by financial institutions for the purchase of HDB flats (including DBSS flats) is reduced from 35 years to 30 years. News loans with tenure exceeding 25 years and up to 30 years will be subject to tighter LTV limits. 29 June, 2013 1. TDSR*: Financial institutions are required to consider borrowers' other outgoing debt obligations when granting property loans. His total monthly repayments of his debt obligations should not exceed 60 per cent of his gross monthly income. -in the case of joint borrowers, that financial institutions use the income-weighted average age of borrowers when applying the rules on loan tenure. 12 January, 2013 1. ABSD: Citizens pay 7/10% on second/third purchase (from 0/3%); Permanent Residents (PR) pay 5/10% for first/second purchase (from 0/3%); foreigners and non-individuals now pay 15%. 2. 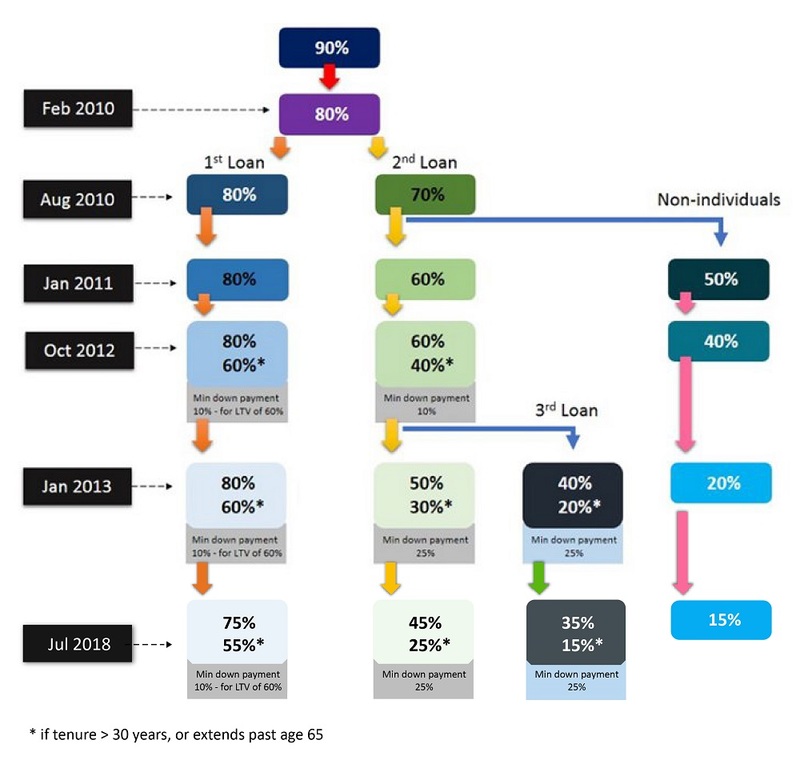 LTV for second/third loan now 50/40% from 60%; non-individuals' LTV now 20% (from 40%). 3. 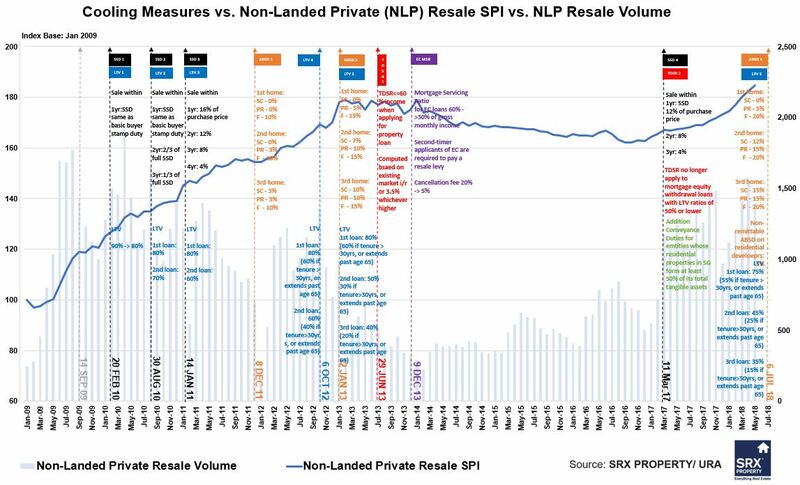 Mortgage Servicing Ratio (MSR) for HDB loans now capped at 35% of gross monthly income (from 40%); MSR for loans from financial institutions capped at 30%. 4. PRs no longer allowed to rent out entire HDB flat. 6 October, 2012	 1. Mortgage tenures capped at a maximum of 35 years. 2. For loans longer than 30 years or for loans that extend beyond retirement age of 65 years: LTV lowered to 60% for first mortgage and to 40% for second and subsequent mortgages. 3. LTV for non-individuals lowered to 40%. -Foreigners and non-individuals pay 10%, PRs buying second and subsequent property pay 3%, Singaporeans buying third and subsequent property pay 3%. -To qualify, developers have to produce proof of development and sale within five years. 14 January, 2011 1. Holding period for imposition of SSD increased to four years from three. 2. SSD rates raised to 16%, 12%, 8% and 4% of consideration. 3. LTV lowered to 60% from 70% for second property. 4. 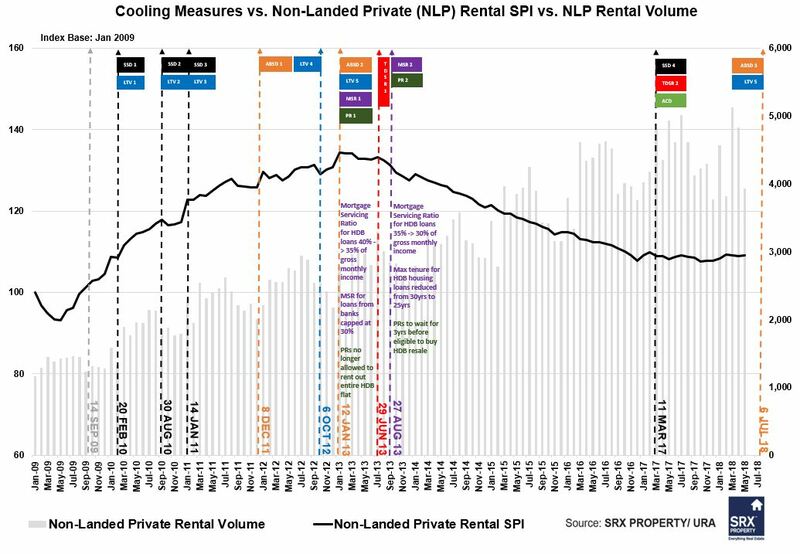 LTV for non-individual residential purchasers capped at 50%. 30 August, 2010	 1. Holding period for imposition of SSD increased to three years from one. 2. Minimum cash payments raised to 10% from 5% for buyers with one or more outstanding housing loans. 3. LTV lowered to 70% from 80% for second properties. 20 February, 2010 1. Introduction of SSD for residential property and land sold within one year of purchase. 2. LTV lowered to 80% from 90% on all housing loans except HDB loans. 14 September, 2009 1. Interest absorption scheme (deferment of instalments until TOP) and interest-only housing loans (interest payment only until TOP) were scrapped for all private properties. *wef Mar 2017, TDSR no longer apply to mortgage equity withdrawal loans with LTV ratios of 50 per cent and below. ©StreetSine Singapore Pte. Ltd. All rights reserved. The Total Debt Servicing Ratio (TDSR) is a framework to ensure that people borrow, and banks lend, responsibly. TDSR limits the amount borrowers can spend on debt repayments to 60 percent of their gross monthly income. 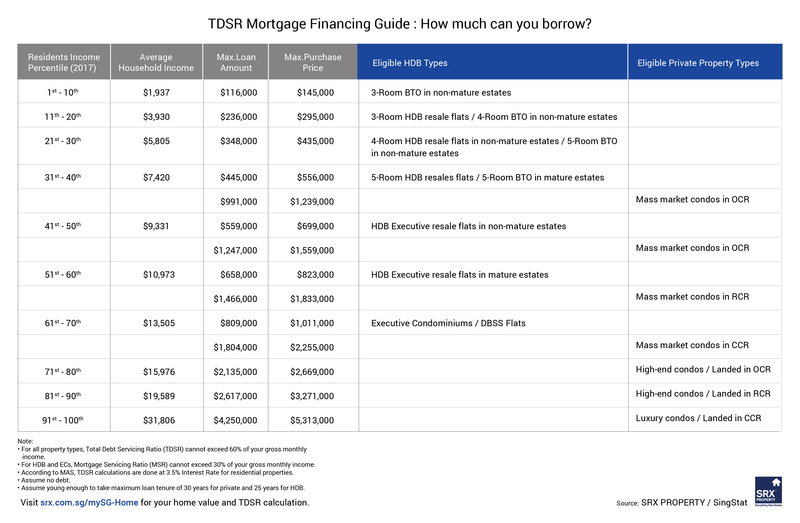 TDSR Calculator Find out the minimum household income you need to have to own your dream home. Discover Your Mortgage Savings on mySG Home now. Please consult a mortgage specialist if you want to take a loan that extends beyond the official retirement age of 65. Note: Total Debt Servicing Ratio (TDSR) cannot exceed 60% of your net income. Mortgage Servicing Ratio (MSR) cannot exceed 30% of your income. Calculations are done at 3.5% Interest Rate. The TDSR was introduced to strengthen credit underwriting practices by financial institutions. Loans are only issued to borrowers who can afford them. How does the TDSR affect you? The TDSR limits the amount you can borrow (your loan quantum) by ensuring your monthly repayments account for less than 60 percent of your income.